For the town of the same name in Devon, see Bampton, Devon. 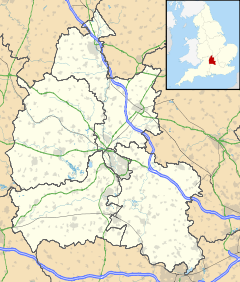 Bampton, also called Bampton-in-the-Bush, is a settlement and civil parish in the Thames Valley about 4 1⁄2 miles (7 km) southwest of Witney in Oxfordshire. The parish includes the hamlet of Weald. The 2011 Census recorded the parish's population as 2,564. Bampton is variously referred to as both a town and a village. The Domesday Book recorded that it was a market town by 1086. It continued as such until the 1890s. It has both a town hall and a village hall. The core of the village is on gravel terraces formed of Summertown-Radley or flood plain terrace deposits. It is just east of Shill Brook, which flows south to join the River Thames, and just north of a smaller stream that flows west to join Shill Brook. The A4095 road passes through the village. The civil parish measures about 3 1⁄2 miles (5.6 km) north – south and about 2 1⁄2 miles (4 km) east – west. It is bounded to the south by the River Thames, to the east by Aston Ditch, and to the west and north by ditches and field boundaries. A small part of the airfield of RAF Brize Norton is in northernmost part of the parish. The Bampton area has been settled since the Iron Age and Roman periods. The Exeter Book of AD 1070 records the toponym as Bemtun. The Domesday Book of 1086 records it as Bentone. A charter or roll from 1212 records it as Bamtun. It is derived from the Old English bēam-tūn, which could mean either "tūn by the beam" or "tūn made from beams". Tūn is an Old English word that originally meant a fence, and came to mean an enclosure or homestead. The earliest parts of the Church of England parish church of Saint Mary the Virgin are 10th- or 11th-century, when it was built as a late Saxon Minster. It was rebuilt in the 12th century as a cruciform Norman church. It received Gothic additions from late in the 13th century to early in the 16th century. The architect Ewan Christian restored it in 1868–70. It is a Grade I listed building. In 1315 King Edward II granted Aymer de Valence, 2nd Earl of Pembroke a licence to crenellate at Bampton. He had Bampton Castle built just west of Shill Brook. Much of the building survived until the Commonwealth of England in the 17th century, when the gatehouse and part of the curtain wall were adapted to form Ham Court. It is now a private house and a Grade II* listed building. After the Norman conquest of England, William the Conqueror granted the church of St Mary the Virgin to Leofric, Bishop of Exeter. The Dean and Chapter of Exeter Cathedral have held the advowson of the parish ever since. Late in the 11th or early in the 12th century the Dean and Chapter had a prebendal house built just west of the parish church. There is some 13th-century work on the east wing, and the house was altered and enlarged in the 16th, 17th and 19th centuries. It is now called The Deanery and is a Grade II* listed building. Weald Manor is a manor house west of Shill Brook and south of Ham Court. It was built in the 17th century and enlarged in 1742. It is a Grade II* listed building. South of St Mary's is Churchgate House, which used to be the Rectory. The oldest part of the house is 16th-century, with a datestone inscribed "1546 Vicar Joan Dotin". In 1799 a new Georgian main block was added to the front of the building by the builder and architect Daniel Harris. In 1635 Robert Veysey, a wool merchant, died leaving £100 to build and endow a free school in Bampton. This was built in Church View near the junction with Church Street, the first schoolmaster was appointed in 1650 and the building was completed in 1653. The building is now Bampton's public library. In 1838 a market house was built in Market Square. For a long time it was the Town Hall. It now houses Bampton Arts Centre and the post office. In 1861 the East Gloucestershire Railway was built through the northernmost part of the parish, about 2 miles (3 km) north of the village. In 1873 a station was opened in Brize Norton parish. It was about 1 mile (1.6 km) south of Brize Norton village and 2 miles (3 km) north of Bampton, but the station was named "Bampton". In 1937 RAF Brize Norton was established and in 1940 the Great Western Railway renamed the station Brize Norton and Bampton. British Railways closed the station and the East Gloucestershire Railway in 1962. Bampton is served by Stagecoach in Oxfordshire bus route 19, which links Carterton and Witney via Standlake. Buses run from Mondays to Saturdays at two-hourly intervals. There is no Sunday or bank holiday service. Bampton has a tradition of Morris dancing which may be 600 years old. Documentary and circumstantial evidence show that Morris dancing in Bampton goes back at least to the 1790s. It used to be performed in Bampton on Whit Monday but the date has recently changed to the late May bank holiday. The town is also the home of Bampton Classical Opera which performs both in Bampton and elsewhere. In Bampton the venue is the garden of the Deanery, a private house near St Mary's church. The Society for the Preservation of Ancient Junketing (Spajers) organises the Bampton Shirt Race around the village on the late May Bank Holiday each year, celebrating the 14 pubs that used to be open. Runners, originally dressed in night-gowns in pairs, with one pushing another in a trolley, stop at the houses that are or were pubs and drink a measure of beer before running to the next. Bampton Youth Centre was founded in 1984 to provide facilities for children and teenagers. It is in the Victorian former primary school building in Church View. Bampton Town Football Club is affiliated to the Oxfordshire Football Association and plays at Buckland Road, Bampton. The club has senior, youth, junior, and veteran teams. The Bampton & District Aunt Sally Association, formed in 1971, plays the traditional throwing game Aunt Sally, which is played at pubs almost all of which are in Oxfordshire. Bampton Skatepark was built for the village's skateboarders and BMX riders. Bampton is one of the settings for the fictional crime novels The Chronicles of Hugh de Singleton, set in about 1366, by Mel Starr. ^ "Bampton Parish". nomis. Office for National Statistics. Retrieved 29 August 2018. ^ Pevsner & Sherwood 1974, pp. 429–431. ^ Historic England. "Church of St Mary (Grade I) (1053559)". National Heritage List for England. Retrieved 29 August 2018. ^ Historic England. "Ham Court (Grade II*) (1053536)". National Heritage List for England. Retrieved 29 August 2018. ^ Pevsner & Sherwood 1974, pp. 432–433. ^ Historic England. "The Deanery (Grade II*) (1053558)". National Heritage List for England. Retrieved 29 August 2018. ^ Pevsner & Sherwood 1974, pp. 433–434. ^ Historic England. "Weald Manor (Grade II*) (1198982)". National Heritage List for England. Retrieved 29 August 2018. ^ Sherwood & Pevsner 1974, p. 432. ^ Historic England. "Churchgate House (Grade II) (1283810)". National Heritage List for England. Retrieved 28 August 2018. ^ Historic England. "Library, with wall and gateway attached to north east corner (Grade II) (1053565)". National Heritage List for England. Retrieved 29 August 2018. ^ Pevsner & Sherwood 1974, pp. 431–432. ^ "Bampton Library". Oxfordshire County Council. Retrieved 29 August 2018. ^ Historic England. "Town Hall (Grade II) (1198742)". National Heritage List for England. Retrieved 29 August 2018. ^ "19 – Carterton – Bampton – Standlake – Witney" (PDF). Stagecoach in Oxfordshire. 3 September 2017. Retrieved 29 August 2018. ^ "Bampton Traditional Morris Men". Retrieved 18 May 2011. ^ "Bampton Town Football Club". Retrieved 18 May 2011. ^ "Bampton & District Aunt Sally Association". Archived from the original on 25 June 2011. Retrieved 18 May 2011. ^ Starr, Mel. "Hugh de Singleton's chronicles:". Retrieved 29 August 2018. ^ Ffrench, Andrew (23 April 2010). "Village is the star of the show". Oxford Mail. Newsquest. Retrieved 6 October 2011. ^ "Downton Abbey film locations". Oxfordshire Cotswolds. New Mind. Retrieved 22 April 2018. ^ "Discovering the real Downton Abbey". Discorver Britain. Chelsea Magazine Company. Retrieved 22 April 2018. Aston, Michael; Bond, James (1976). The Landscape of Towns. Archaeology in the Field Series. London: J.M. Dent & Sons Ltd. pp. 87, 88. ISBN 0-460-04194-0. Blair, John (1984). "Saint Beornwald of Bampton" (PDF). Oxoniensia. Oxford: Oxfordshire Architectural and Historical Society. XLIX: 47–54. Ekwall, Eilert (1960) . Concise Oxford Dictionary of English Place-Names (4th ed.). Oxford: Oxford University Press. Bampton. ISBN 0198691033. Giles, John Allen (1847). History of the Parish and Town of Bampton, with the District and Hamlets Belonging to It. Oxford: JH Parker. Sherwood, Jennifer; Pevsner, Nikolaus (1974). Oxfordshire. The Buildings of England. Harmondsworth: Penguin Books. pp. 429–435. ISBN 0-14-071045-0. Wikimedia Commons has media related to Bampton, Oxfordshire. "Bampton, Oxfordshire". The Villages Of The Cotswolds. The Cotswold Gateway. 2010. This page was last edited on 12 December 2018, at 13:34 (UTC).